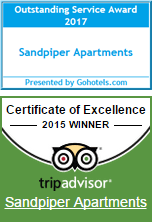 Broadbeach holiday accommodation doesn’t get any better than here at Sandpiper Resort. 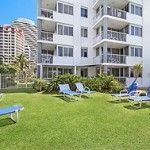 This Gold Coast beachfront resort is located directly opposite the beach with park lands and playgrounds on the beach foreshore within walking distance from your holiday apartment. 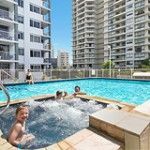 Of course it wouldn’t be the perfect Broadbeach holiday accommodation choice without a pool. Don’t worry we have a recently renovated heated outdoor pool and spa which is the perfect place to relax on our holiday. Choose from a great range of fully self contained 1 and 2 bedroom holiday apartments. All are fully self contained with spacious interiors and with full kitchen facilities. Making holiday dinners will be a breeze in these serviced apartments. All apartments are east facing with apartments on level 3 and above featuring stunning ocean views. Make the most of the generous balcony area which is the perfect place to enjoy a relaxed breakfast before hitting the shops or Gold Coast theme parks or a wind down after a busy day out. These Broadbeach holiday apartments are ideally located being a short walk to the Oasis shopping mall as well as Pacific Fair. For those visiting Broadbeach on business you will find the Gold Coast entertainment and convention centre as well as Jupiters Casino easily accessible. Don’t forget the Gold Coast theme parks….these family favourites are a short drive from Broadbeach with Sea World at Main Beach being 20 minutes drive and Dream World, Movie World and Wet ‘n’ Wild about a 40 minute drive. For the energetic you will find great pathways that follow the beach with the heart of Surfers Paradise only a 30 – 40 minute walk away. Pack your togs as safe, patrolled swimming can be found at Broadbeach and world famous Snapper Rocks surf break only about 30 minutes drive away. 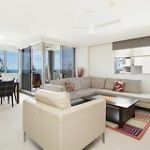 With so much to see and do on the Gold Coast, Broadbeach is the ideal location to base yourself with Sandpiper Resort offering the ideal Broadbeach holiday accommodation for your next Gold Coast holiday.